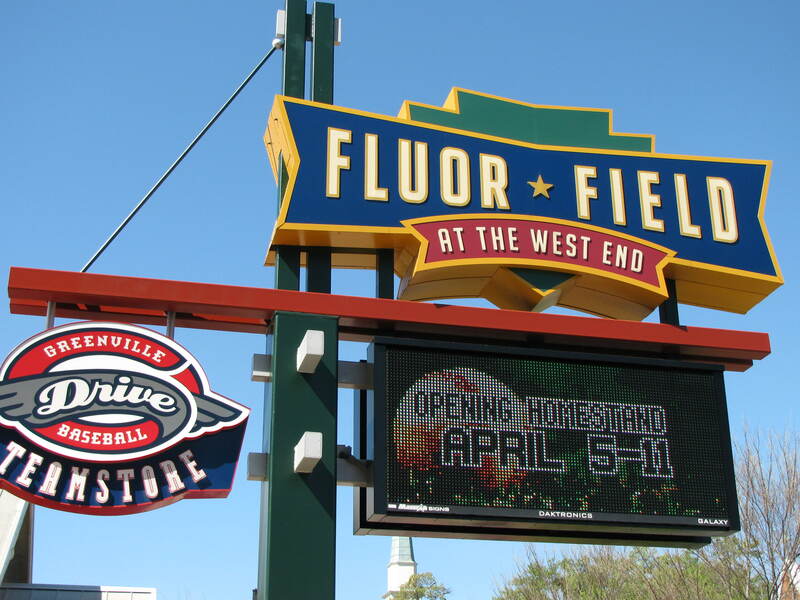 It is that time of the year and the minor league ballpark in downtown Greenville, Fluor Field, will begin to come alive again on April 5th. One of Greenville's many fabulous attractions has been the addition of this ballpark in the west end of downtown. While there were many pundits who were skeptical about whether or not Greenville could support this venture back when it was proposed, no one has doubts anymore. Modeled after Fenway Park, home of the Boston Red Sox, Fluor Field has its own "Green Monster." The look and feel are the same as if you were actually in Fenway, and the atmosphere is tremendous! Each season has more than 70 home games and the field itself plays host to numerous other civic functions and alternative sporting events. Tickets are very affordable and there is hardly a bad seat in the stadium. One of the best times a family can have is to plan a night out at a Drive game. The cost of the entertainment is extremely reasonable and represents a fun, safe way to enjoy all that Greenville can offer in a professional sporting arena. Any time Greenville is highlighted in national television or media publications for ranking near the top for places of interest, the Drive stadium is one of the main features. Many times, my wife and I have been involved in group nights out downtown where we will meet at Liberty Tap Room, a restaurant adjacent to the stadium, eat dinner and then attend a ball game. It really is hard to believe we have such a wonderful facility and friendly environment to enjoy an event such as what is offered here.